In our last article, Should You be Taxed as an LLC or an S Corporation, we hinted at one way you could save money on taxes: Electing to be an S Corporation (S Corp). In this article we’ll work through some of the benefits of being an S Corp, the requirements involved, and when it may be a good time for you to make this election for your business. If you haven’t read the previous article, we recommend reading it first here. It sets a good foundation for you before reading this one. Like we shared, the biggest benefit of being an S Corp is the potential to save money on your taxes. How do you save money on your taxes this way? We’ll show you through a flow chart. This chart is from Jason Watson from Watson CPA Group. The chart shows the difference between how your income is taxed when it’s in a business that’s a LLC taxed as a sole proprietorship versus a LLC taxed as an S Corp.
Let’s walk through the visuals together. The left visual shows how your income is taxed when your business is taxed as a LLC with sole proprietor tax status. In this example, it shows your business makes $100,000 net income. All $100,000 is subjected to self-employment taxes at 15.3%. Additionally, that same $100,000 income is subjected to Federal ordinary income taxes. So, this visual shows your $100,000 net income is taxed in two ways: once at 15.3%, then again at ordinary income tax rates. Now, let’s look at the right visual. The right visual shows how your income is taxed when your LLC is taxed as an S Corp.
One requirement of being an S Corp is you must be paid a reasonable compensation by your business. In this example, it shows your business having the same net income of $100,000, but you decide to pay yourself a reasonable salary of $50,000. So, your $50,000 salary has social security and Medicare taxes taken out. These are often called payroll taxes and are similar to the self-employment taxes in the left visual. This income of $50,000 is reported on a W-2 and is then taxed at ordinary income tax rates. At the same time, the other $50,000 in income could be taken as a distribution. Instead of this income receiving self-employment taxes or payroll taxes, it only receives ordinary income taxes on your personal tax return. In a nutshell, the S Corp strategy hinges on a portion of your business’ income bypassing self-employment or payroll taxes and is only taxed at your ordinary income tax rate. This could save you money. So, what do the savings really look like? Again, Jason Watson & the Watson CPA Group put together a great example for us to see what your savings could look like when electing to be an LLC taxed as an S Corp versus remaining an LLC taxed as a sole proprietor. Let’s walk through what the table shows together. We’ll focus on the fifth row that starts with $100,000. What this row shows us is that your business is making a net income of $100,000. The second column titled LLC SE Tax shows the amount of taxes you owe if your company is an LLC taxed as a sole proprietor. Under this tax structure, you’ll be paying self-employment taxes on your total income. This shows you owe $14,130 in taxes. The third column titled S Corp Payroll Tax shows how much you owe in taxes if your business is an LLC taxed as an S Corp. 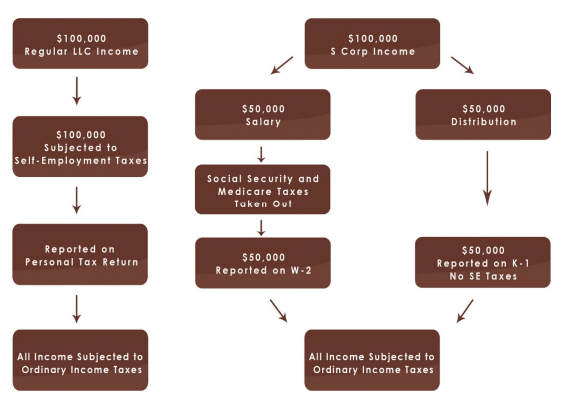 Under this tax structure, you’ll be paying payroll taxes on a portion of your income. As an S Corp, you owe $7,650 in taxes when your business is making the same amount of money. The difference is shown in the fourth column titled Savings. Your savings paying taxes as an S Corp is $6,480! Keep in mind this simple example shows your potential difference in savings on your taxes when you compare the self-employment taxes owed versus the payroll taxes owed. If you remember the brown boxes above, your income still has to be taxed at ordinary tax rates (shown in the bottom boxes in both visuals). Now before you click out of here and start the process of electing to be an S Corp, there’s more you need to know. To get the status of being an S Corp, there are many requirements to follow. Some of these will cost you money including doing your payroll and paying someone to do more complicated taxes. 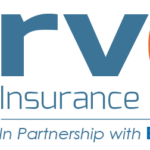 The new costs may not outweigh the benefits for you yet. Let’s look at some of the major requirements together. To make the shift from a sole proprietorship to an S Corp, you have to be ready to fulfill certain requirements. The requirements are in place to hold folks accountable to acting like a Corporation if you are going to claim to be an S Corporation. The biggest thing is you must pay yourself a reasonable compensation. What is reasonable? Currently, there’s no black and white rule on this. Tax court cases have shown IRS auditors have used the Bureau of Labor Statistics to support their view of reasonable compensation. As a starting point, you can view wage information by your occupation and your domicile zip code here. Additionally, to get a reasonable compensation number, you could have your CPA contact the company RC Reports to create a Reasonable Compensation Report for you. The company will ask you a lot of questions about what you do and will provide a suggested reasonable compensation number for you. If the IRS were to ever challenge you, you can use this report as support for your decision. You must have an Accountable Plan set up and adopted by the Corporation. This is a formal process to reimburse employees (yourself) for personal money spent on behalf of the company. These reimbursements could include mileage expenses, health insurance premiums, and other business expenses. Another requirement is you must keep board minutes. We suggest you keep board minutes at least quarterly. Of course, you should have a business bank account to create a full separation from your business finances and your personal finances. These are just some of the major requirements that aren’t really spelled out for you by the IRS. You can see a list of the official requirements to qualify for S Corp status here. So, when’s the right time to transition to an S Corp? Let’s jump into this next. When’s the Right Time to Transition to an S Corp? A good rule of thumb is you should start exploring electing to be an S Corp when you reach $30,000 net income. This is because the tax savings benefits of electing to be an S Corp don’t outweigh the requirement costs until you get around this point. Like the table showed earlier, when you make $100,000 net income and change to an S Corp, you could receive $6,480 in tax savings. However, with the requirements we discussed earlier of running a proper S Corp, you’re looking at more expenses now. For example, the first year you decide to transition, you have to file forms to change your tax status to an S Corp. As an example, Nuventure CPA LLC charges $1,200 to get your S Corp organized. You may also decide to pay someone to do your payroll and someone to complete your taxes for you. Again as an example, Nuventure CPA LLC charges $800 to complete S Corp taxes. So, your new expenses to be a S Corp total at least $2,000. However, looking past the first year, you won’t have the $1,200 set up fee and you’ll only be paying someone to do payroll and your taxes. It may be the right time for you to make this transition. So, how you do you elect S Corp status? To do this, you’ll complete Form 2553 Election by a Small Business S Corp if your current tax status is a LLC taxed as a sole proprietorship. Here are four different times you can submit the Form. 1. When you’re starting your business. If you’re just starting your business, you have 75 days to complete the form starting from your date of incorporation. 2. By March 15 to apply for the current year. If your business is already operational, you can elect to be taxed as an S Corp for the current tax year as long as you file Form 2553 by March 15th of that year. 3. By March 15 to apply for the previous year. If your business is already operational, you can elect to change your tax status for the previous year when you’re submitting your return. For example, if it’s February 2018 and you were a LLC taxed as a sole proprietor in 2017 you can elect to change this to be taxed as an S Corp in 2017 instead. To do this, you’ll file Form 1120S US Income Tax Return for an S Corp and attach Form 2553. The catch with this route is that you would need to run historical payrolls to show you paid yourself a reasonable compensation. Doing this, you may incur penalties and interest that outweigh your tax savings. 4. Potentially any other time. You could also file anytime by completing Part H of Form 2553. In this section on the form, you need to give a legitimate reason for filing late. However, the IRS can still reject your reason for filing late. Guide to LLCs and S Corps, 2017 Edition, a great resource on understanding S Corps. Watson shares difficult concepts in language everyone can understand. If you want to dive deeper into these concepts, you can get the book here. Want to Talk to Someone about Your Unique Situation? Everyone’s situation is different. You can ask questions and get clarity on if you should transition to an S Corp by connecting with a CPA. 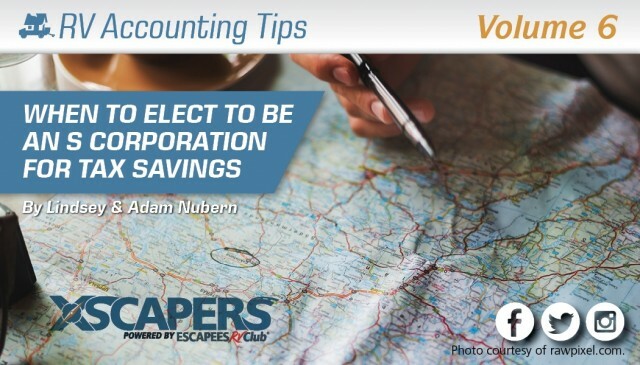 Xscapers works with Adam Nubern of Nuventure CPA. You can send Adam a quick note here.